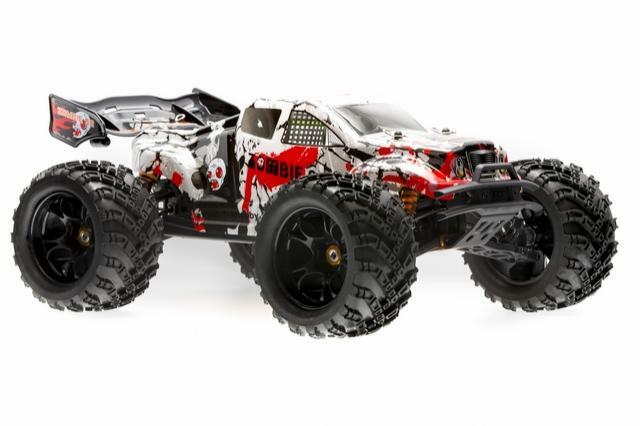 Competition performance and ‘Truggy’ style without the mess and noise of Nitro, that’s what the Zombie is all about! What’s more, it’s just about ready to run out of the box. All you need to add are some transmitter batteries. The one thing that the Zombie does different is to make a statement. That statement is ‘Fun’! Not only do you get all-terrain performance, you get a ‘wicked’ colour scheme and body as well. In all respects, the Zombie is not for the feint hearted. The high power, brushless, inrunner motor coupled to a durable 100A, fan-cooled ESC extracting maximum performance and fun from the included 3S cell 2600mAh Li-Po battery. Enough to give any .21 nitro engine a run for their money. The motor is kept cool by a finned, CNC machined mount that you can fit an optional fan to if required. But power isn’t everything. You need to transmit that power into the ground and this is where the Zombie comes into its own. You have 4WD through 3 differentials, metal gears in the differentials and metal drive shafts. The front hub carriers are aluminium for low unsprung weight and durability. Needless to say, The car is upgraded to ball bearings for long life and minimum power loss. Grip is transmitted via large, tough wheels and chunky, all-terrain tyres, with a high-speed ‘V’ pattern. A tread pattern that works, copes with just about any off-road surface but especially loose ones.